From the back cover: "Nothing goes right for Eloise. The one day she wears her new sued boots, it rains cats and dogs. When the subway stops short, she's always the one thrown into some stranger's lap. Plus, she's had more than her share of misfortune in the way of love. In fact, after she realizes romantic heroes are a thing of the past, she decides it's time for a fresh start. Setting off for England,, Eloise is determined to finish her dissertation on that dashing pair of spies, the Scarlet Pimpernel and the Purple Gentian. 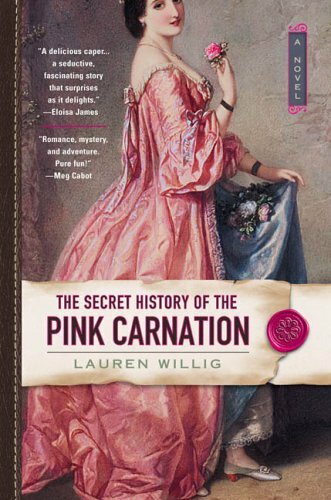 But what she discovers is something the finest historians have missed: the secret history of the dPink Carnation---the most elusive spy of all time. As she works to unmask this obscure sy, Eloise stumbles across answers to all kinds of questions. How did the Pink Carnation save England from Napolean? What became of the Scarlet Pimpernel and the Purple Gentian? An will Eloise Kelly escape her bad luck and find a living, breathing hero all her own?" This was a great story. The characters were well developed and the dialogue filled with sassy humor. Going in the Second Chance Bookbox. Took this out of the Second Chance Bookbox. Looks interesting. This was a great book! Very humourous at times. Released for week#15(lingerie) of Never Judge a Book By Its Cover release challenge and the Keep Them Moving release challenge. Enjoy!